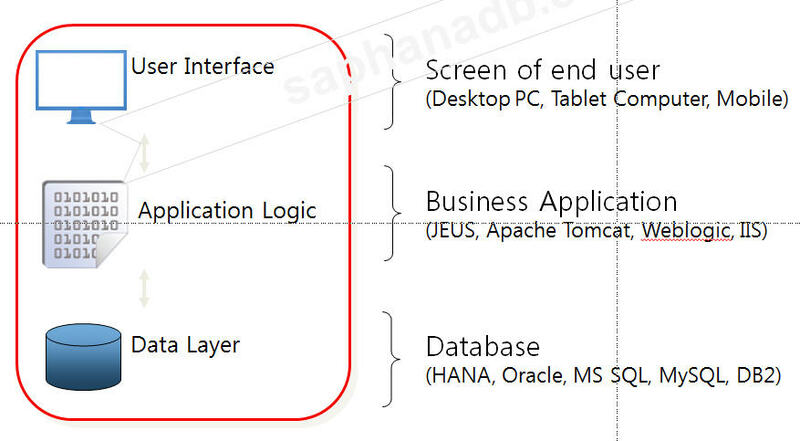 SAP S/4 HANA System Architecture(구조)를 이해할 수 있도록 좀더 쉽게 설명을 하겠습니다. 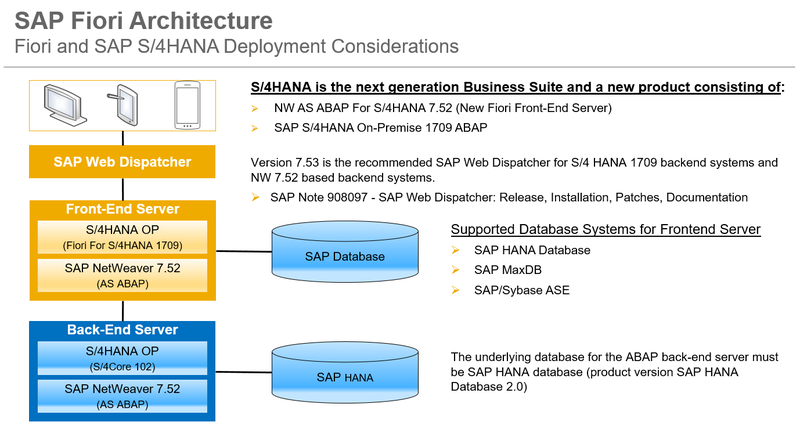 S/4 HANA System을 이해하기 위해서는 먼저 선행해서 알아야 할 것이 SAP ERP System에 대한 이해입니다.SAP ERP 6.0과 SAP NetWeaver 7.0의 System 구성 방법을 이해하고 그 다음에 S/4 HANA System 구성에 대해서 설명하도록 하겠습니다. SAP ERP 6.0 과 S/4 HANA의 System Architecture 구성하는 방법에 Cloud와 On Premise 방법이 있습니다. 제가 여기에서 설명하는 S/4 HANA System Architecture는 모두 On Premise 방법으로 Cloud환경은 설명하지 않고 오직 On Premise 관점에서 S/4 HANA System Architecture 를 설명하겠습니다. 먼저 SAP ERP 6.0 과 NetWeaver 7.0에 대한 System Architecture를 설명하겠습니다. SAP가 ERP와 S/4 HANA의 출시 연도에 대한 내용입니다. 2.모든 어플리케이션을 구성하기 위해서 가장 기본이 되는 사용자 PC에서 서버로 접속하는 개념을 먼저 설명하겠습니다. 일반적인 Business Application에 해당되는 것이 업무를 처리하는 구성으로 가장 대표적인 것이 제우스, 아파치 톰캣, 웹로직이 Business Application에 해당됩니다. SAP ERP System도 Business Application에 해당되어 중간 부분의 Application Logic 에 속합니다. 3.SAP에서 사용하는 용어에 대해서 먼저 설명을 하고 SAP Application에 대한 설명을 하겠습니다. SAP에서 사용하는 용어는 처음부터 확립되어서 진행하는 것이 아니고 SAP 제품(ERP, BW, CRM, SRM, SCM등)이 나오면서 그에 맞게 용어가 새롭게 나오게 되고 변경이 되어서 SAP에서 사용하는 용어를 쉽게 예를 들어서 설명하겠습니다. SAP System 와 SAP Instance, Process에 대한 용어를 자세하게 설명하겠습니다. SAP System : SAP Solution이 설치된 Software 입니다. SAP System은 1개의 Database와 여러 개여 Application Server Instance로 구성되어 있습니다. SAP Instance : 자원(Resource)의 그룹(묶음)이다. 이 자원은 메모리, 워크 프로세스, 디스패쳐, 케이트웨이 등이 있다. SAP Instance는 Services 제공하는 단위로 여기에는 SAP 여러가지 제품을 서비스라는 개념으로 제공하는 것을 이야기 한다. 개인에게 서비스를 제공하기 위해서는 자원을 하나의 그룹으로 묶어서 개인에게 서비스를 제공한다. 그 자원의 묶음을 SAP Instance라고 한다. – Dialog Instance : Dialog Instance는 Application Level에 존재하는데 다이얼로그 인스턴스는 일반 사용자가 접속할때 그에 대한 응답을 처리하는 곳이다.다이얼로그 인스턴스는 다른 Server(hosts)에 위치하여 자원은 분배하여 위치할 수 있다.접속하는 사용자가 많아지면 하드웨어 자원을 증가 시키야 하고 그에 따른 Dispatcher, Workprocess 도 늘려줘야 한다.부하를 분산하는 기능을 수행한다. – Central Instance : Central Instance는 Enqueue와 Message Server로 구성되어 있다. 이 Central Intance의 중요 기능은 여러 개의 Dialog Instance와 통신하여 요청한 내용을 Dialog Instance로 전달하는 기능을 수행한다.Lock 기능을 수행하여 내가 수행하고 있는 것을 다른 사람이 작업하지 못하도록 잡는 Lock 기능을 Enqueue work Process가 수행한다. – Central services Instance(SCS) : Instance사이에 Communication을 수행하는 Message Server와 Lock을 관리하는 Enqueue Server로 구성되어진 Instance이다. 4.SAP ERP 6.0에 해당되는 NetWeaver AS ABAP System에서 사용자 PC에서 SAPGUI로 접속하면 SAP Application Server에서 Business Process를 처리하는 과정을 그림으로 설명한 내용입니다. 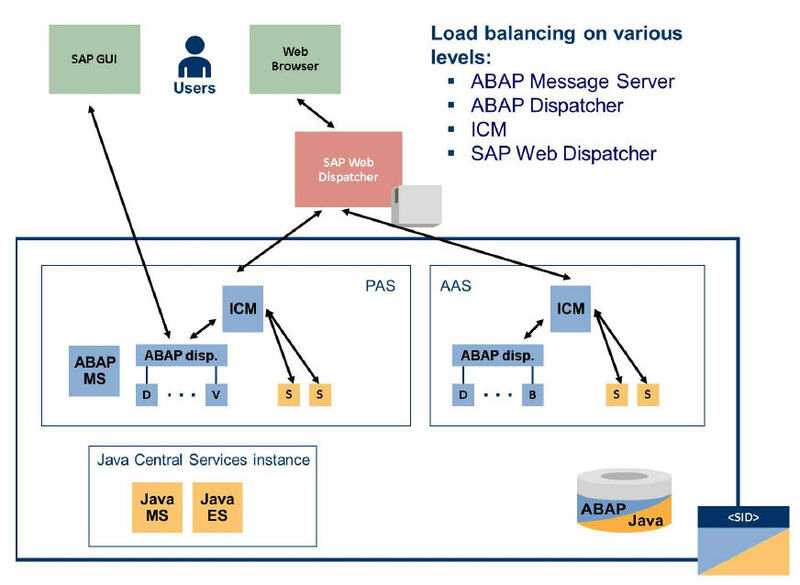 사용자의 데스크탑 PC에서 SAPGUI로 SAP ERP System을 접속하게 되면 ABAP Dispatcher가 가장 먼저 사용자 요청을 받아서 Dialog Work Process에 사용자가 요청한 내용을 전달합니다. SAPGUI와 다르게 사용자가 크롬이나 MS Internet Explorer인 Web Browser로 접속하게 되면 ICM(Internet Communication Manager)를 먼저 접속을 하고 사용자 요청을 받아서 Dialog Work Process에 사용자가 요청한 내용을 전달합니다. 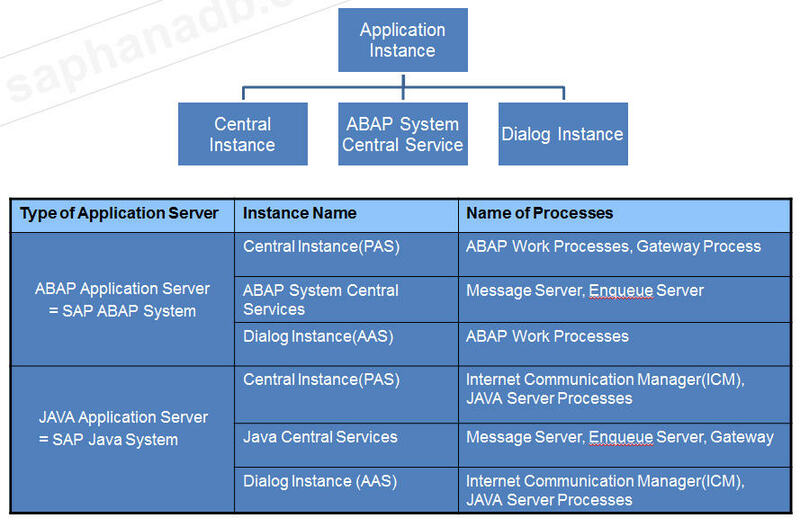 5.SAP NetWeaver 7.0에서 Central Instance(CI)와 Dialog Instance(DI)을 구성하는 내용을 설명한 것입니다. CI(Central Instance)에는 ABAP MS(Message Server)와 Enqueue Server를 포함하는 구성으로 CI에는 반드시 ABAP MS(Message Server)와 Enqueue Server가 존재해야 합니다. 6.SAP NetWeaver 7.1 이상 버전에서 새롭게 변경된 것을 설명하겠습니다.Start Service와 ASCS가 새롭게 추가된 것을 확인 할 수 있습니다. ASCS Instance를 별도의 서버로 구성하여 이전 버전인 NetWever 7.0에서 CI(Central Instance)에서 Message Server와 같이 존재하여 CI가 부하를 줄이 수 있고, Message Server와 Enqueue Server만 별도로 고 가용성을 구성하는 High Availability(HA)를 구성할 수 있습니다. 7.SAP NetWeaver 7.1 이상에서는 용어가 변경이 되었습니다. SAP NetWeaver 7.1 이상 버젼에서 변경된 사항을 비교하면서 설명을 하고 변경된 용어에 대해서 이유와 이렇게 하면 장점이 무엇이 있는지 설명하도록 하겠습니다. 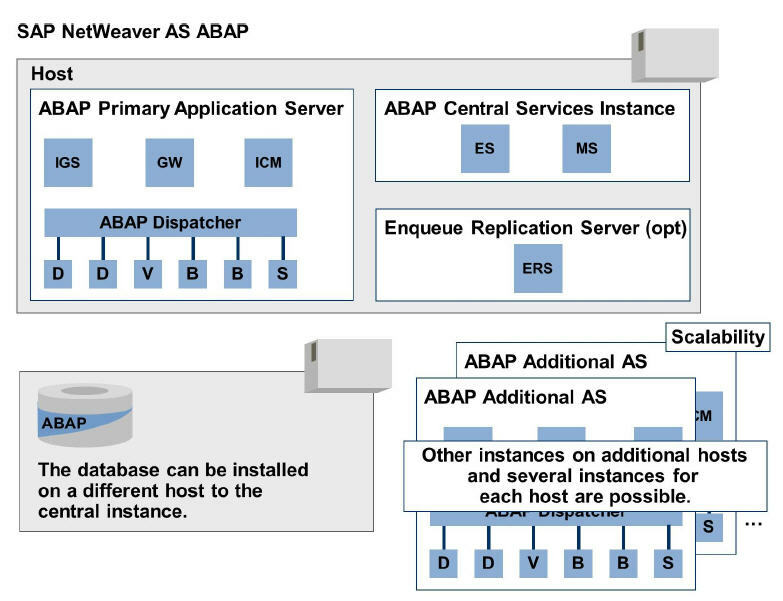 SAP NetWeaver 7.1 이상에서는 가장 크게 변경된 것은 NetWeaver 7.0 이전 버전에서 존재하는 Central Instance(CI)가 ASCS와 PAS로 분리 되었습니다.Central Instance(CI)에 존재하는 Message Server와 Enqueue Server가 별도의 H/W에 구성할 수 있도록 ABAP System Central Service(ASCS)로 별도로 나오게 되었습니다.그리고 PAS(Primary Application Server)는 CI에서 Message Server와 Enqueue Server를 뺀 나머지로 구성되었습니다. 그래서 PAS는 기존의 NetWeaver 7.0의 DI와 같은 기능을 수행합니다. NetWeaver 7.0 이전 버전에서 존재하는 Dialog Instance(DI)는 AAS(Additional Application Server)로 이름이 변경되었습니다. 다음 단계에서 NetWever 7.0과 NetWeaver 7.1 에서 변경된 부분을 비교하면서 이해야기 쉽게 설명하도록 하겠습니다. 8.SAP NetWeaver 7.0 와 NetWeaver 7.1 이상에 대한 System Architecture에 대한 변한 내용을 설명하겠습니다. 가장 큰 변화는 NetWeaver 7.1에서 새로 생성된 ASCS를 별도로 분리해서 SAP System을 구성할 수 있는 내용입니다. 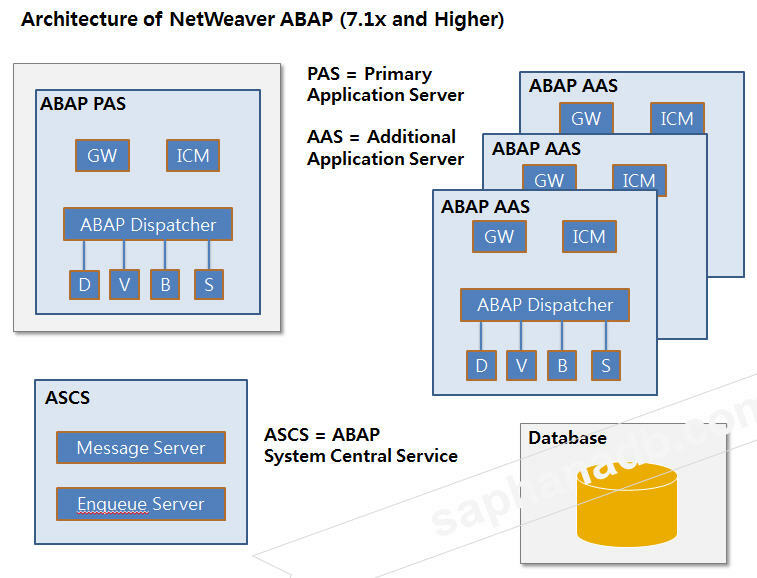 SAP NetWeaver 7.0이하 버전에서 CI(Central Instance)가 NetWeaver 7.1이상에서 PAS(Primary Application Server)와 ASCS(ABAP System Central Services)로 변경되었습니다. 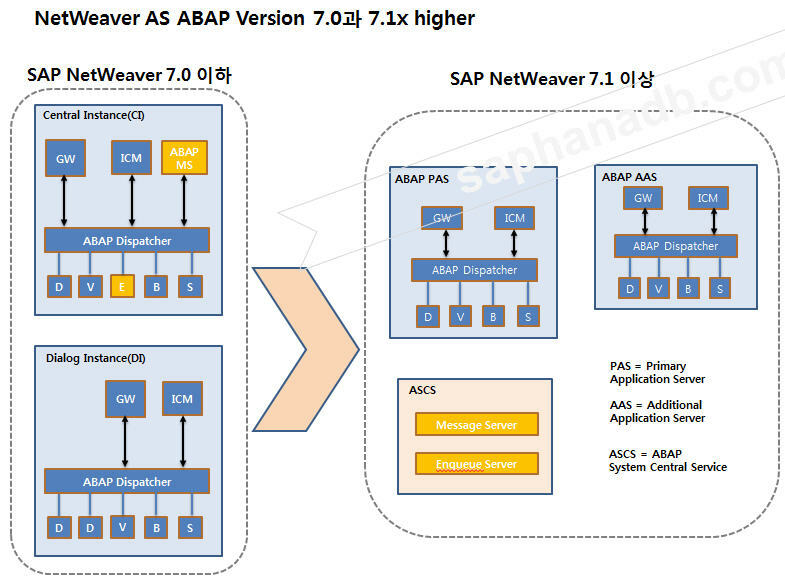 SAP NetWeaver 7.0이하 버전에서 DI(Dialog Instance)가 NetWeaver 7.1이상에서 AAS(Additional Application Server)로 변경되었습니다. CI(Central Instance) : NetWeaver 7.0에서 Message Server와 Enqueue Server를 가지고 있는 Instance이다. 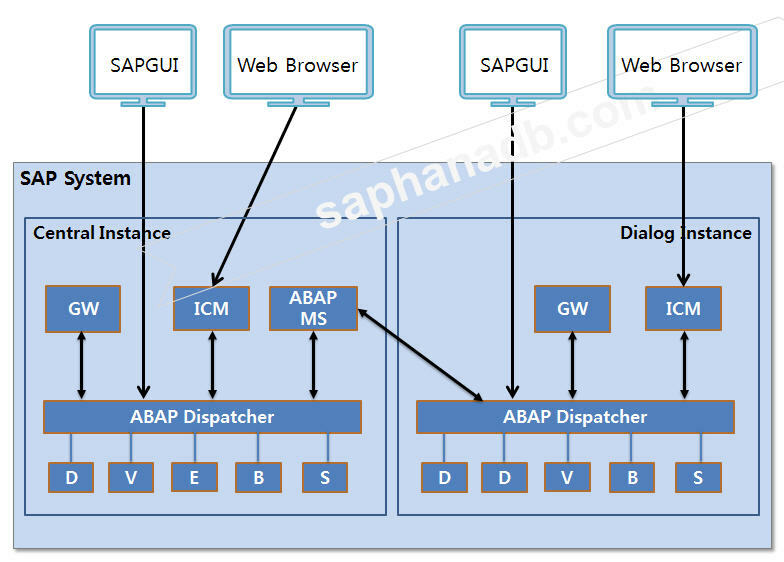 Central Instance는 ABAP MS(Message Server), ABAP Dispatcher, ICM, GW, Dialog, Update, Enqueue, Background, Spool Work Process로 구성되어 있다.여기에서 Central Instance가 Dialog Instance와 구별되는 Message Server와 Enqueue Process가 있는데 이 두개의 기능에 대해서 자세하게 설명하겠습니다.Message Server는 SAPGUI로 로그인 할때 부하분산기능을 수행합니다.또한 Application Server의 ABAP Dispatcher사이에 통신 기능을 수행합니다. DI(Dialog Instance) : NetWeaver 7.0에서 Application Server를 확장하기 위해서 사용하는 Instance로 사용자가 증가함에 따라 DI를 계속해서 추가하여 SAP System을 구성할 수 있습니다. Dialog Instance는 ABAP Dispatcher, ICM, GW, Dialog, Update, Background, Spool Work process로 구성되어 있다.여기에서 Central Instance가 존재하는 Message Server와 Enqueue Process를 제외한 다른 Work process가 있는 Instance를 말합니다. 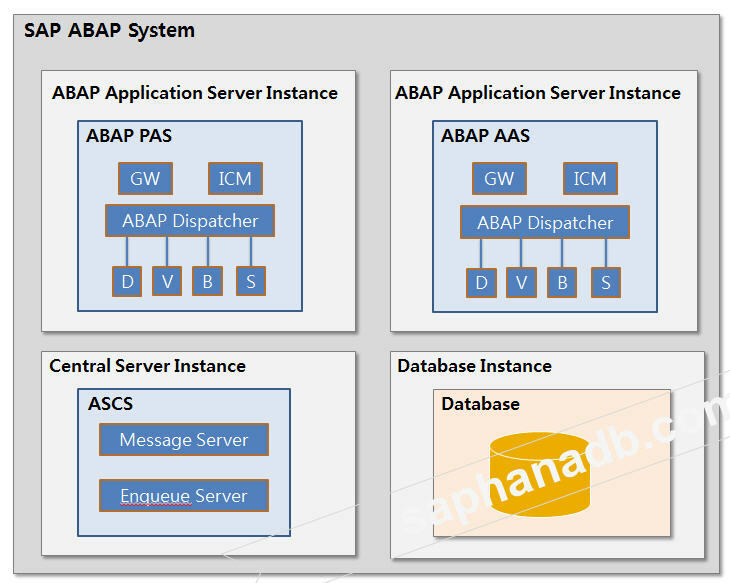 9.SAP NetWeaver AS ABAP System 7.1 이상 버전에 대한 각 Application Server Instance별로 구성을 설명하겠습니다. 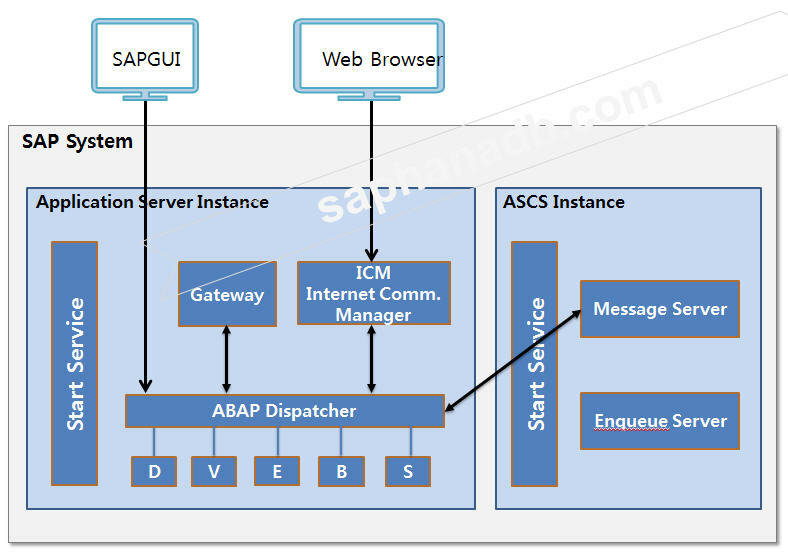 Message Server(MS) : SAP Instance의 Dispatcher와 다른 SAP Instance의 Dispatcher 사이에 통신을 하는 수행합니다. 어러 대의 Dialog Instance가 존재하는 SAP System환경에서 대용량 처리를 가능하게 합니다. Message Server는 SAP System에 오로지 한 개만 존재해야 합니다. Enqueue Server(ES) : Enqueue Server는 ABAP프로그램에서 Table의 lock을 관리하는 기능을 수행합니다. SAP System에서 정확히 1개만 존재해야 합니다. 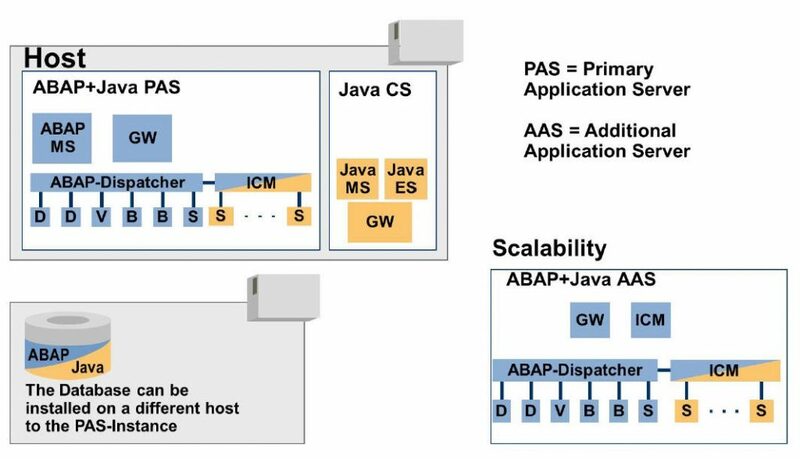 Gateway Process(GW) : Gateway Process는 SAP System과 다른 외부의 Application System사이에 서로 Communication하는 역할을 수행한다. Internet Communication Manager(ICM) : Internet Communication manager는 Web Brower같은 HTTP요청에 대해서 처리하는 역할을 수행한다. Dispatcher : Dispatcher는 사용자가 리포트 실행 이나 테이블 조회를 요청한 내용을 Work Process에 전달하는 역할을 수행한다. 하나의 Work Process가 일을 하고 있으면 쉬고 있는 다른 Work Process로 요청한 내용을 전달하여 요청한 내용을 분배시키는 역할을 한다. Dialog Work Process : Dialog Work Process는 사용자가 테이블 조회하는 요청을 실체로 수행하는 역할을 한다. Spool Work Process : Spool Work Process는 사용자가 프린터를 하고자 할 때 프린터로 DATA를 전달하여 프린터가 수행되는 하는 역할을 한다. SAP System의 환경에 맞게 여러 개를 구성할 수 있습니다. 그러나 적어도 1개의 Spool Process가 있어야 합니다. Update Work Process : Update Work Process는 Data를 업데이트하는 요청을 수행하는 역할을 한다.한 개의 서버에 적어도 1개가 존재해야 합니다. Update Process(UP)는 높은 우선순위인 V1을 요청하는 것을 수행하는 역학을 한다. UP2(Update 2 Processes) : Update2 Process는 우선순위가 낮은 Update를 수행하는 역할을 한다. Background Work Process : Background Work Process는 배치잡으로 스케줄을 수행할때 사용하는것으로 야간이나 정기적인 시간에 작업을 해야 할 때 사용한다. SAP NetWeaver AS Java 7.1이상 버전에 대한 각 Application Server Instance에 대한 구성을 설명하겠습니다. AS Java 7.1 버전과 이상 버전에서 달라지는 점은 ICM과 Server Process로 구성된 Java-PAS 입니다. SDM와 Java Dispatcher가 더 이상 존재하지 않습니다.그 기능을 모두 ICM(Internet Communication Manager)가 담당을 하고 있습니다. Java-Primary Application Server(PAS) : Java-PAS는 ICM과 여러 개의 Server Process로 구성되어 사용자 요청을 ICM이 받아서 Server Process에게 전달하여 업무를 처리합니다. 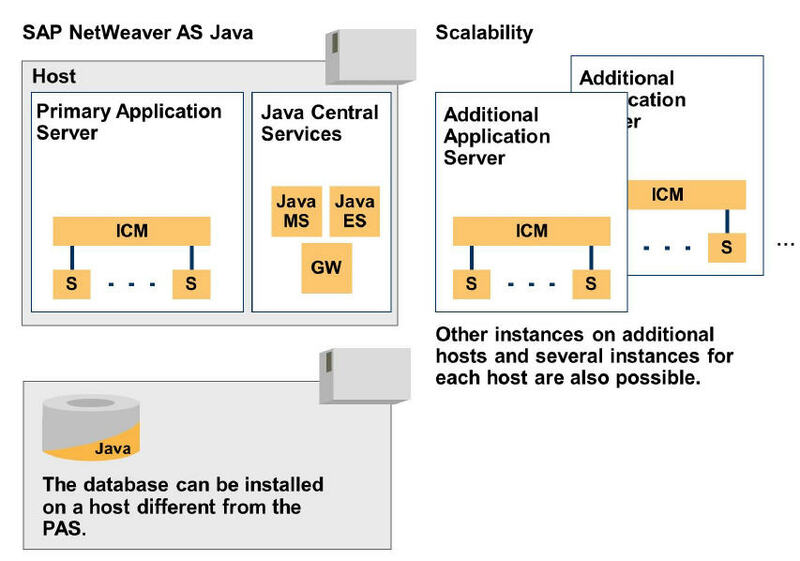 Java-Central Service(CS) : Java-CS는 Java MS(message Server), Java ES(Enqueue service), GW(Gateway) Process로 구성되어 있습니다. Java-Additional Application Server(AAS) : Java-AAS는 ICM과 Server Process로 구성되어 여러대의 서버에 추가적으로 계속해서 설치가 가능한 구조로 사용자가 많이 접속할 때 여러 대 서버에 설치 할 수 있습니다. 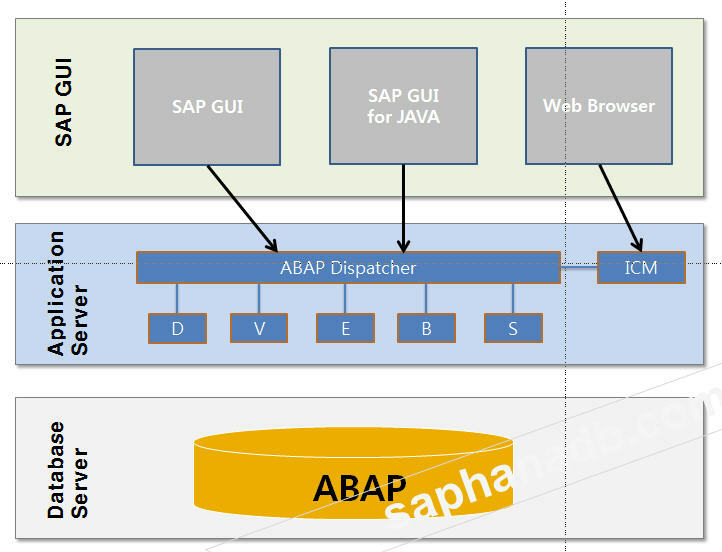 SAP Application Server(AS) ABAP + Java의1 이상 버전에 대한 구성내용을 설명하겠습니다. 이렇게 구성을 할 수 있는 시스템은 PI(Process Integration)과 SAP Solution Manager 7.1이 Application Server(AS) ABAP + Java을 혼합하여 구성하여 사용하고 있습니다. 그런데 SAP NetWeaver 7.3 이상부터는 즉 SAP AS ABAP + Java를 하나의 서버에 같이 공존하여 구성하는 것을 권장하지 않고 있습니다. 그래서 기존에 SAP AS ABAP + Java 같이 구성되어 있는 것은 떼어내는 Split 툴을 지원하여 ABAP, Java를 분리하여 구성하도록 하고 있습니다. 12.SAPGUI와 Web Browser를 통해서 SAP NetWeaver 7.1 이상 버전에 접속하는 내용을 설명하겠습니다. SAPGUI는 Load Balancing을 하는 것은 SAP Logon Group으로 설정하여 여러대의 SAP 서버에 접속하게 하는 것은 Message Server에서 Application Server의 Load Balancing을 담당합니다. 그리고 Web Browser를 통해 접속하는 것은 SAP Web Dispatcher를 이용하여 여러대의 Application Server로 접속하도록 합니다. 이 Web Dispatcher가 Load Balancing 역할을 수행합니다. 13.이제 SAP S/4 HANA를 구성하는 방법을 설명하겠습니다. S/4 HANA를 구성하기 위해서는 SAP에서 강조하는 것이 UI(User Interface)를 휴대폰, 테블렛등 모바일을 지원하는 것입니다. 다양한 PC의 환경을 지원하기 위해서 HTML5를 기반으로 하는 UI인 Fiori를 사용하여 구성해야 한다는 것입니다. 그래서 SAP S/4 HANA를 구현하기 위해서 HTML5를 사용하는 Fiori를 포함하여 S/4 HANA Architecture를 구성해야 한다는 것입니다. 우리가 지금까지 알고 있는 SAP ERP 6.0에 해당 되는 것이 SAP ABAP Back-end Server입니다. 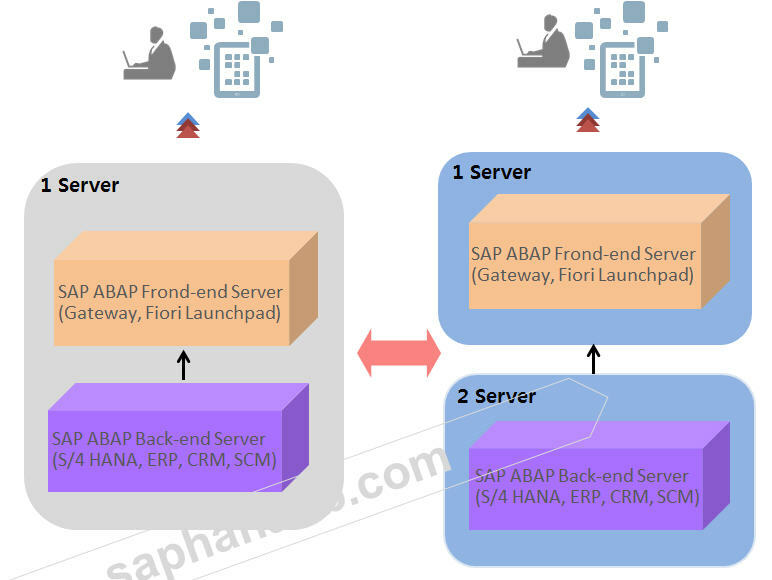 S/4 HANA를 구축하지 않는다면 SAP ABAP Back-end Server만 구성하면 SAP ERP 6.0을 사용할 수 있습니다. 그러나 S/4 HANA를 사용하기 위해서는 Fiori Launchpad를 구축해야 해야 합니다. 다음으로 우리가 고민을 해야 하는 순간이 왔습니다. SAP ERP 6.0에 없었던 SAP ABAP Front-End Server를 다른 별도의 서버로 구성을 할 것인지 아니면 S/4 HANA에 포함시켜서 구성을 해야 하는지 결정을 해야 합니다. 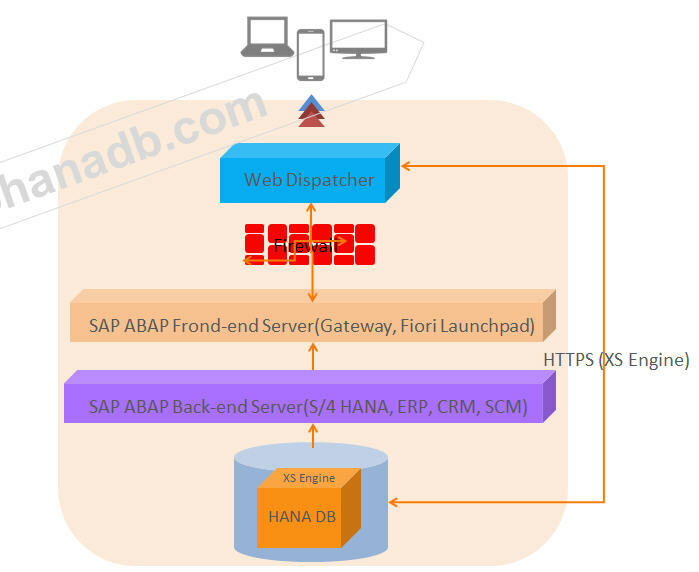 가장 일반적인 방법은 S/4 HANA 개발서버와 검증서버는 1대의 서버에 SAP Backend Server와 Front-end Sever를 같은 서버에 설치하는 방법입니다.그리고 S/4 HANA 운영 시스템은 각각 별도의 서버에 SAP Front-end Sever를 설치하고 또 다른 서버에 SAP Backend Server 를 설치하여 구성하는 방법입니다. 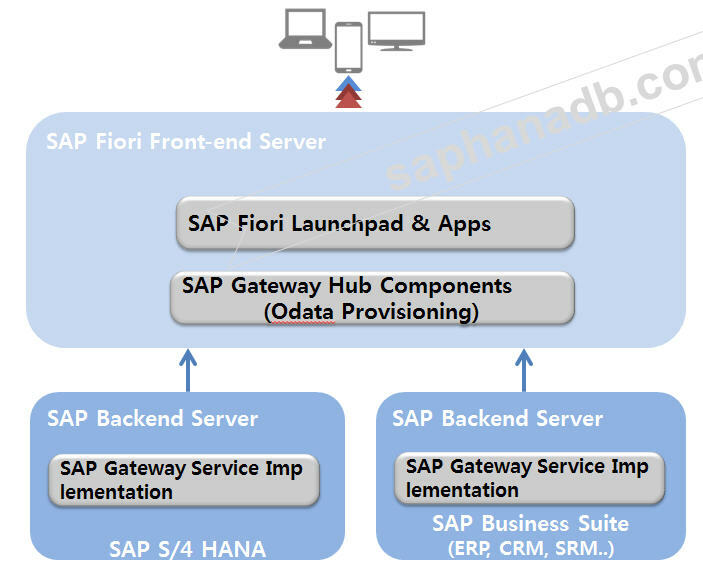 15.SAP Fiori 서버를 구성할 때 1대의 서버에 Front-End Sever를 구성할 경우에는 반드시 HANA DB를 사용하지 않고 SAP MaxDB나 SAP Sybase ASE를 Database로 구성할 수 있습니다. 여기서 오라클 Database는 Front-End Sever의 DB로 구성 할 수 없다는 것입니다. 그리고 S/4 HANA의 Back-End Server 반드시 SAP HANA DB를 사용해야 한다는 것입니다.